In this section, you will learn the process of choosing the wallet. In order to be involved in Bitcoin, You need to have a wallet. A wallet allows you to receive bitcoins, send bitcoin, store bitcoin. Here, I will take an example of a page called bitcoin.org to choose wallet. Bitcoin.org was a site that was developed by Satoshi Nakamoto and Martti Malmi. Martti's no longer an active developer, but he maintains the Bitcoin.org websites. He is not involved in developing Bitcoin. Bitcoin.org is not tied into any specific core developers. It's an open source project and handled by a global community. Bitcoin.org is a very good starting point to explain how to choose your wallet because there's a lot of options available. 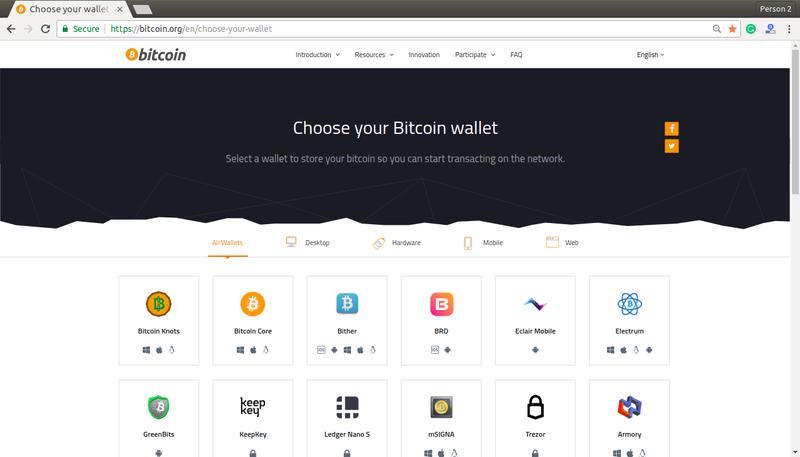 In this page, we will go to an option called Choose your wallet. It can be shown in the below image. We can see that there are different types of wallets that you can choose like Desktop wallet, Mobile wallet, Web wallet, Hardware wallet, etc. In the mobile wallet, you can run any type of application whether it's on Android, iOS, Windows, or even on Blackberry. They are significantly smaller and simpler and serve as a convenient on-the-go wallet for daily usage. Popular Mobile wallets are: Bitpay, BTC.com, Edge, Electrum, Mycelium, Bitcoin Wallet, etc. In the desktop wallet, you can run it on your desktop or laptop computer for Windows, Mac, Linux. Generally, they are secure, but sometimes they are vulnerable to various malware and computer viruses. Popular Desktop wallets are: Bitcoin core, Bitcoin Knots, mSIGNA, Armory, etc. In a hardware wallet, there are devices that contain your private keys. They are the most secure wallets, but they also cost money. Popular hardware wallets are: BitBox, Keepkey, Trezor, Ledger Nano S, etc. The web wallets are online wallets that are considered less secure than other types of wallets, yet they can be highly convenient. Popular web wallets are: Guarda, Coinbase, GreenAddress, Binance, etc. There are multiple different wallet options that you can have and can install on your mobile device, or on your computer, or a web one, but you don't necessarily have just one wallet. You can have multiple wallets for different needs. It helps you to spread the risk by not keeping all of your personal cryptos in one location but across different wallets. You can create a wallet in any of these options that you find. If you wish, you can open up another wallet elsewhere and can send coins to a different wallet. If you want to get started fast, select one of the wallet options that are available here. A key one that I would recommend is trying one of the web wallet options that are presented here and open up an account and then try to send bitcoin to someone, buy bitcoin from someone, and store bitcoin in your wallet. Hot/Cold Wallet: Whether a wallet is a hot(Online storage) or cold(offline storage). Control private keys: A wallet where you own and control your keys. Backup & security features: Seed backup keys and pin codes. Developer community: Active development community for maintenance. HD Wallet: A wallet that generates new addresses itself. KYC: A wallet that doesn't require KYC.